Edward Bohlin is one of the most famous makers of flashy and custom-made saddles, spurs, and bits. He worked in Hollywood at a time when Western movies were enormously popular and he made custom leather goods as well as saddles, bits, and spurs for many famous Hollywood actors and other wealthy people. Many of his spurs feature the initials or ranch brand of the original owner in addition to the use of elaborate silverwork, gold in three colors and sometimes even gemstones. The quality of items produced in Bohlin’s shop is really the pinnacle of what was being made at the time. His leather and saddlery items are stamped “Bohlinmade Hollywood, Calif”. 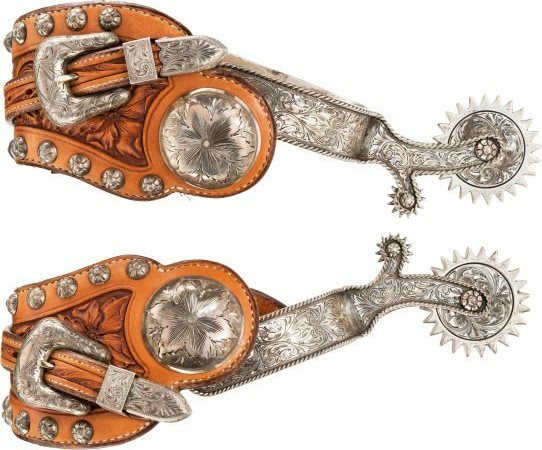 Known as the supplier to Hollywood and the stars, Edward Bohlin produced masterful silverwork for spurs, belt buckles, boots, saddles, bits and all manner of western attire. His products were seen onscreen in many Hollywood movies and early western TV shows such as the Lone Ranger. He also supplied many wealthy riders with gear for the Tournament of Roses Parade and rode himself in the parade for many many years. Most of his spurs are marked “Bohlinmade Hollywood Calif.” near the button. His work is of supreme quality and is highly prized and very collectible. Click here for information on Bohlin Maker’s Marks.